how to find your personal best peak flow number. how to use your personal best number to set your peak flow zones. how to take your peak flow. when to take your peak flow to check your asthma each day. It is important to find out your personal best peak flow number. Each person's asthma is different, so your personal best peak flow number may be different from another person's personal best number. Between noon and 2:00 p.m. each day. Each time you take your quick-relief medicine to relieve symptoms. 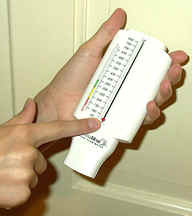 Measure your peak flow after you take your medicine. Any other time your doctor or asthma educator suggests. Write down the number you get for each peak flow reading. The highest peak flow number you had during the two to three weeks is your personal best. Your personal best can change over time. Ask your doctor when to check for a new personal best. Green Zone (80-100 percent of your personal best) signals good control. Take your usual daily long-term-control medicines, if you take any. Keep taking these medicines even when you are in the yellow or red zones. Yellow Zone (50-79 percent of your personal best) signals caution: your asthma is getting worse. Add quick relief medicines. You might need to increase other asthma medicines as directed by your doctor. 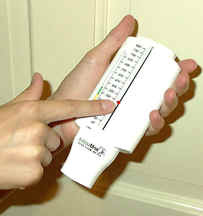 Red Zone(below 50 percent of your personal best) signals medical alert!. Add or increase quick-relief medicines and call your doctor now. Move the marker to the bottom of the numbered scale (zero). Repeat steps one through six two more times. Write down the highest of the three numbers. This is your peak flow number. If blowing out hard causes coughing and smaller numbers each time, write down the first number and make a note in your diary about what happened and why you wrote this number down. Every morning when you wake up, before you take medicine. Make this part of your routine. 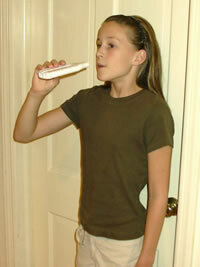 When you are having asthma symptoms or an attack. Also after you take medicine for the attack. This can tell you how bad your asthma attack is and whether your medicine is working. Also, ask your doctor or asthma educator to check how you use your peak flow meter – just to be sure that you are doing it right.